Sichuan food, which originates from China’s Southwestern region, is the country’s most popular cuisine. 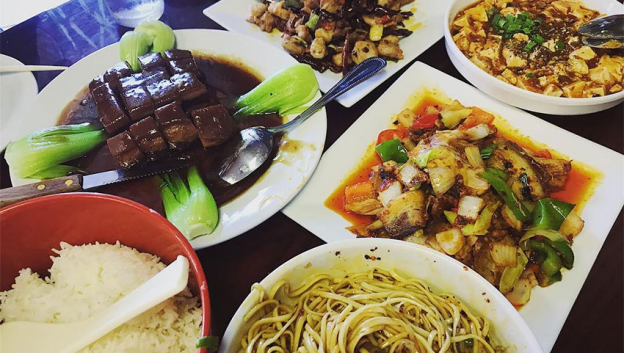 Diners appreciate the rich, deep flavors coupled with the spicy taste of Sichuan pepper. It’s difficult to find this pepper in any other region of China. Typical seasonings for Sichuan dishes include broad bean chili paste, chili, black pepper, ginger, shallots, and garlic. Fresh produce choices typically include beef, pork, fish, tofu, and vegetables. Baking, braising, fast-frying, steaming, and stir-frying are the most common cooking methods, with fast-frying coming in as the most popular. Kung Pao Chicken: While many versions of this dish exist, its basic ingredients remain the same. They include chicken cubes, deep-fried peanuts, and dried chili pepper. Chefs preparing authentic Kung Pao chicken keep the taste pure by not including fresh peppers or any other type of side ingredients. The taste is sweet and sour from the combination of chicken, chili pepper, and peanuts. Cold Diced Rabbit: This dish relies on peanuts and chilies to give it a hot, unique flavor. It also includes extremely hot and sour sauce that coats the bite-sized pieces of rabbit. This offsets the cold meat inside of the coating. It can be challenging for diners to pull every piece of chunky meat through the bone, but the reward is tender meat softened by chili oil. Shuizhu Yu: Shuizhu Yu combines fish with a huge amount of chili oil for a hot, moist taste. The fish, which is usually carp, flounder, sole, or catfish, are first covered in cornstarch, brined, and marinated. Chefs then place the tender fish into a bowl containing hot broth. The dish also contains chili oil previously flavored with Sichuan peppercorns and dried chilies. Diners end up dragging the pieces of fish through a thick coating of oil that adds to the flavor. Twice Cooked Pork: This Sichuan stir-fry gets its name from the fact that chefs cook it twice before serving it to diners. The pork belly gets cooked almost to completion the first time around, but the chef stops and adds fresh peppers and garlic sprouts. After the second cooking, the chef adds two types of seasoning called dou-chi endow and doubanjiang. Those who love Sichuan dishes so much that they can’t wait to go out to a restaurant can prepare Dan Dan Noodles at home. The preparation time is 15 minutes and cook time just 10 minutes. It requires stir frying the sesame and then deep frying the peanuts. Next, thin the sesame paste with oil, chop the Sichuan peppercorns, and stir them into the pan. Now it’s time to mix the Sichuan peppercorns, sesame peanut, black vinegar, chili oil and flakes, stir fried sesame, soy sauce, and chopped peanuts together. Once the mixing of the Dan Dan sauce is complete, the final step is to pour it on plain noodles for an exceptional taste experience.